Andy through to Melanddi And beyond……..
Or maybe it was Kim. A girl from school who was a couple of years older than me that I had a real crush on. But, for shaping my working and creative life, I suppose I have to say that it was music. I was brought up on a Council Estate in Hackney. Mum and Dad were both factory workers and money was always tight. 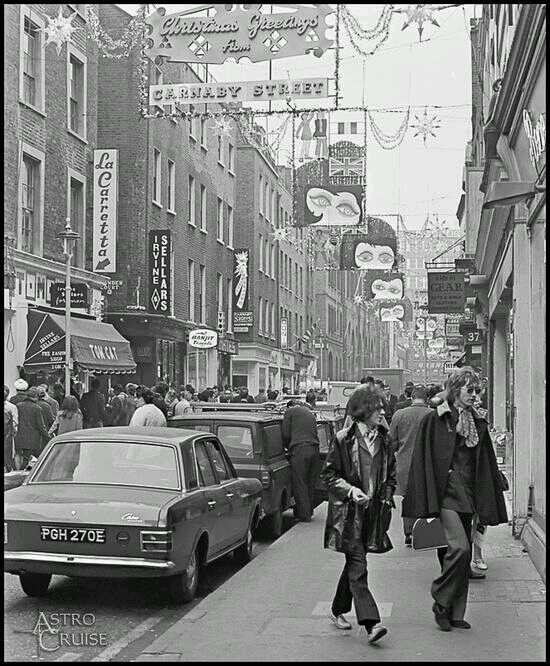 1973 saw me get a job selling jeans and T/shirts for 2 pounds a day in Oxford Street thanks to my brother who was working next door in Shelly’s Shoes. When Shelly’s advertised Saturday work for 5 pounds a day, well, that was for me. This must have been around 1974 and I carried on working for Shelly’s on Saturdays and school holidays up until I left school in 1976. It was great fun learning how to help the girls zip up skin- tight knee, (and higher) platform boots. And not just platforms for the girls. The boys were also following the Glam Rock Bands of the time. This then morphed into the “super group” bands who were wearing everything from platforms, stack- heeled pointed- toe handmade boots and then moving onto the phenomenon of Cowboy Boots. So I left school and took on my first “proper” full- time job, which was described as a trainee sales representative opportunity in a trimmings wholesaler in Gt Marlborough Street, just off Oxford Street. In fact I spent most of my time sweeping the floor or pushing a trolley- load of trimmings to other wholesale and retail shops in the West End. I also learned quickly how to LOOK busy to avoid the dragon lady manageress who gave out the worst jobs!! Looking back, I`m sure this is where Ricky Gervaise got the characters for The Office 20 odd years later. The place really was filled with misfits and other “unemployables”, myself included. I still kept on my Saturday job at Shelly’s and one day they were putting up signs advertising for trainee managers, as they were looking to expand with the next year being the Queen´s Silver Jubilee. I applied for and duly got the job. A new shop was opened at the Marble Arch end of Oxford Street. I was put on commission and with it being silver jubilee year it was SO busy. Cowboy boots were huge. 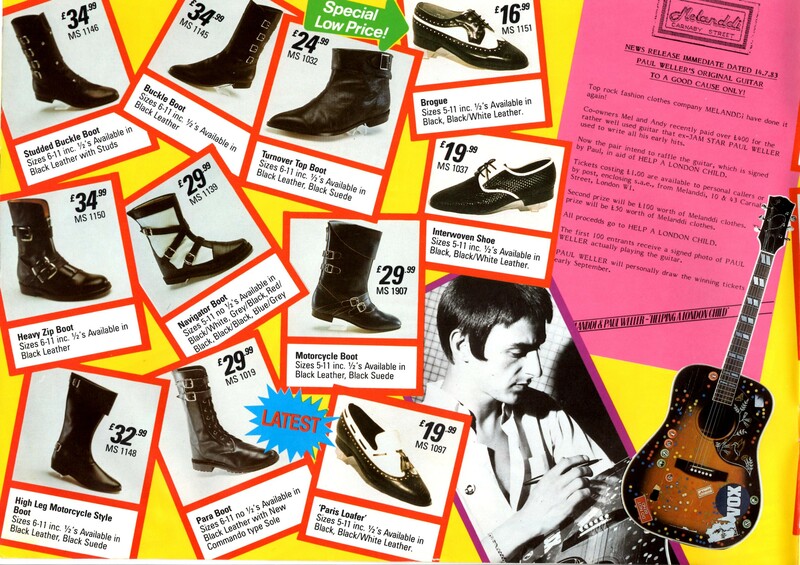 Platforms were still selling along with high- heeled shoes for men and women, Punk was entering the mainstream with its winkle pickers and buckles and studs. 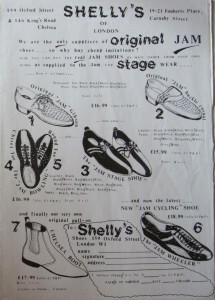 I think the original Jam Shoe came out about then. And a short lived but very popular “gold- tipped” piece of metal inserted between the upper and the sole was also selling well. It was all different and I loved it. Music was changing from Glam and Heavy Rock into Disco and of course Punk and New Wave Bands were coming through. Once again. It was all different. AND I LOVED IT. With Cowboy Boots, demand was outstripping supply. Most of the boots were made in Spain and the importer couldn’t keep up. This was very frustrating to have the customers and no stock and then, out of the blue, a man came into the shop with a suitcase and asked for the manager, and at the princely age of 17, that was me. He turned out to be Korean and he had, in his suitcase, almost exact copies of all the current out of stock best-selling cowboy boots and a few other styles that hadn’t been seen before but that I liked. After a few phone calls to track the guv´nor down, (remember, there were no mobile phones then), I told him the story and was given the nod to order what I thought we should have. Within a couple of days, about 60 cartons of assorted ladies and men’s cowboy boots were delivered. I did a big display. AND WE SOLD LOADS. A few weeks later I was telling the story to my cousin, Mel, and he, who always had an eye for a bit of business, said if you can do this for someone else then why not do it for yourself, or rather, ourselves. He wanted to go into business with me. Well, I wasn’t too sure. Yes, I had always dreamed about owning my own shop and trying out my own ideas, but again, as a council house boy I thought it was just a dream. Also, I was earning great money due to the volume of business being done but Mel was very persuasive and around September of 1978, Melanddi was born. And the name, just a mix of Mel and Andy with a little change to give it an Italian feel. Mel had seen a shop for rent, well not actually a shop, but a wall in a shop at Number 8, Carnaby Street. 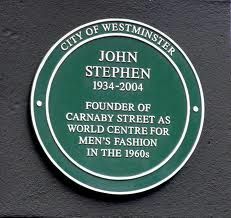 We both liked Carnaby St due to its history and the fact that it was so central. We went down to see it, paid a deposit and we were off. There are so many stories to tell, of punch-ups with the other wall owners who didn’t like the fact that we were so busy, (at that time I was always a bit game for a punch up.) To chasing after people with stolen credit cards or shoplifting. But that was just how things were. As always, I should have kept a diary but I couldn’t foresee what Melanddi was going to become and, in truth, you’re either a diary writer or you’re not. So there are so many stories that have just been forgotten. So, after a particularly big fight with our neighbours one Saturday we were asked to leave the premises. There we were with all our stock and nowhere to sell it from. Luckily for us, 2 doors away was a jean shop which was struggling and they offered to rent us half of their shop. This doubled our room for the same rent so was a great deal brought about by adversity, and a rather well placed jab on the nose of a fellow trader. Within a few months we offered to buy out the Jeans shop and we took over the whole premises and went from being just a shoe shop to the complete Melanddi. Funnily enough this shop is where ´Merc´ is now. Our shop was more like a club than a shop. HUGE speakers playing cassettes of all the latest bands at maximum volume. And clothes and shoes everywhere. The shop was always busy,always buzzing. It’s all a bit clinical these days and the Melanddi of old was anything but clinical. 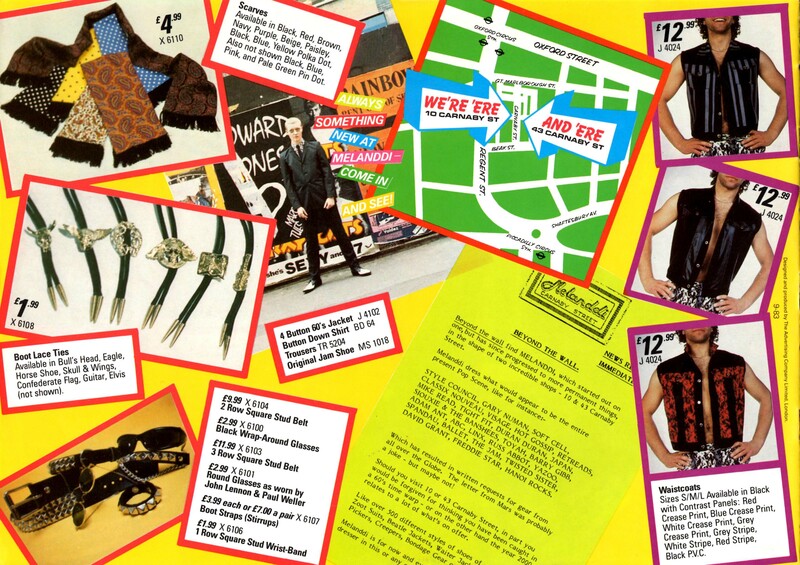 Have a look at some of the pages from our mail order catalogues for an idea of what we did and remember, pretty much everything was in stock. 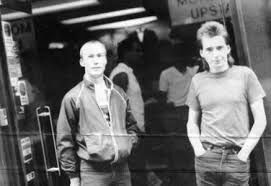 The Mod, 2- tone, Ska, Skinhead look was really taking off along with the new romantic look and we sold everything from ALL the shoes, plastic mini dresses, two- tone suits, sta pressed trousers in every colour and also checks, stripes and dog tooth. Striped blazers, Union Jack jackets and of course, our shirts. We must have had 250 different colours and patterns. And we had them in stock. Always. We sold thousands, and at only 9.99 they were cheap, even then. Yes in those days the quality wasn’t brilliant. But look at the prices. I wanted everything affordable for our customers, and that meant that sometimes the quality did suffer. 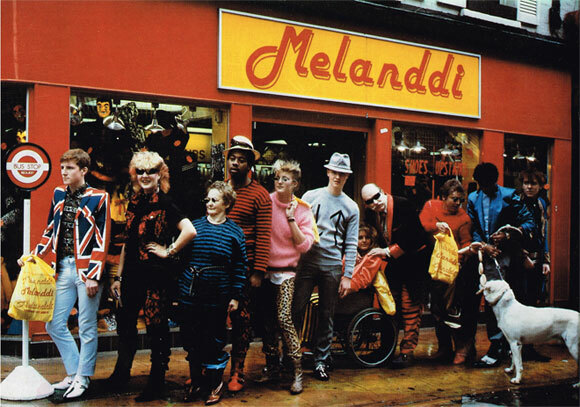 But 30 odd years on there’s still LOADS of original Melanddi stuff changing hands on the likes of E bay etc for more money than was originally asked so the quality wasn’t that bad. And, considering how high profile we were we didn’t have to hide from many disgruntled customers. In fact, in August 2013, Bruce Foxton ran a competition to give away one of his ORIGINAL Melanddi shirts that he had worn all through The Jam era and had continued to wear on tour with his new band From The Jam. So that shirt had lasted more than 30 years. But more on that later!!! And most importantly, at the time of owning the shops, we had THOUSANDS of loyal returning customers which is testament that the Melanddi product was the RIGHT product at the RIGHT price. Now this may seem a bit cliched, so I am apologising now, but MELANDDI WAS AN EDUCATION. IT’S NOT WHAT I EARNED BUT WHAT I LEARNED. It’s taken a few years, well, 30- odd actually, to realise that there has to be a balance between quality and price. You get what you pay for and you get nothing for nothing. Up the quality and pay a bit more. 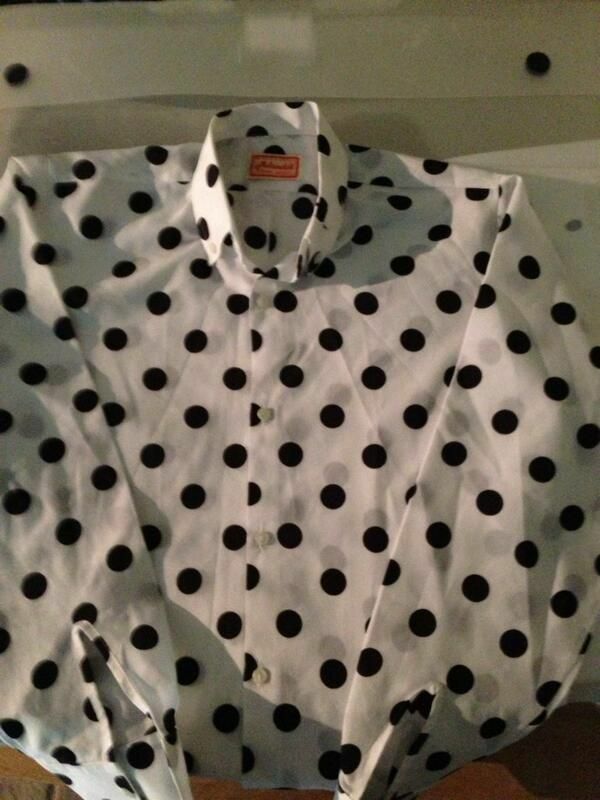 And that’s what I’ve done with my new range of 60`s inspired shirts. But more of that on the shirt page of my website. Over the next few years, business boomed. 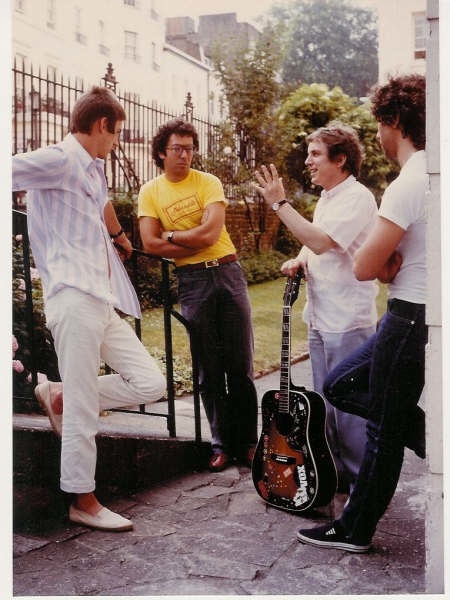 It was helped, by no small amount, with visits from the likes of The Jam- Paul, Bruce and Rick were regular visitors and we took as many photos, on our Kodak Instant camera, (do you remember them? ), as we could of the boys trying on all manner of shoes and clothes. If only I knew what happened to all those pictures. The likes of Madness, Joe Strummer, Gary Numan, Adam Ant, Spandau Ballet, Marc Almond, Toyah, Rusty Egan, Steve Strange, David Essex, Adam Faith, Boy George, Duran Duran, Dee Schneider, various members of The Specials, Selector, Secret Affair, The Merton Parkas, The Bee Gees, Hanoi Rocks to name but a few all passed through our doors. Wednesday was filming for Top of The Pops so we invariably had a visit from a band or two wanting something different to wear on T.V. the following night. And, we didn’t realise what a big deal it was to be supplying shoes and clothes to some of the biggest names IN THE WORLD music- wise. And it wasn´t a case of being “star-struck”. These people came in as normal people and we served them in the same way we served all our customers. There was no pomp and ceremony. One story sticks in my mind. Remember, I used to come up with ideas, find fabrics and then deliver it to whatever factory I was using, so it was always challenging to get what I wanted. I remember once buying a roll of fabric from a little shop in Brick Lane, which is in the heart of The East End of London. It was at the top of a piece of ancient wooden racking on the top floor of a shop that probably should have been knocked down years before, but these little old shops could sometimes un-earth real gems. I could only just make out that this particular roll of fabric had a design somewhere in between Paisley and a Regency Brocade due to the fact that there were no lights in this room. It was in a chocolate with gold design and looked like it was in velvet and I thought it would make some great 4 button regency style jackets, a real Sgt Pepper´s moment. Anyway I had them put the roll in the back of my van and I took it off to the factory. It was COVERED in dust and had probably been there for 20 years or more so I was well pleased with my find. I duly delivered it to the factory and told them what I wanted. A couple of hours later I got a phone call just to confirm that it was what I wanted made and I told the secretary again. A week later, I turned up at the factory to pick up my jackets and couldn’t believe them. They looked fantastic. It was only on closer inspection that I realised that what I had thought was velvet turned out to be CARPETING. THE JACKETS STOOD UP ON THEIR OWN. The factory manager told me that they had broken 3 machines making them as the fabric was so thick. Anyway. I loaded them up. There were about 10 of them and got them into the shop. They did look great but you had to have the strength of a body builder and be living in Antarctica to wear one. One of the members of The Bollock Brothers came in and really liked and bought one. He thought it hysterical when we stood it up next to him as he was paying and this is what he (supposedly) did with it on stage at a concert. If only I`d taken a photo…. And we sold them all. Though this wasn’t the start of me looking to buy more carpeting!!! The Palladium meant we had visits from all sorts of stars, ranging from Bruce Forsythe, the boys from It Aint Half Hot Mum, Michael Crawford and really too many and it’s too long ago to remember them all. If there had been digital cameras and mobile phones it would have made remembering all the faces who darkened our doorway a bit easier. 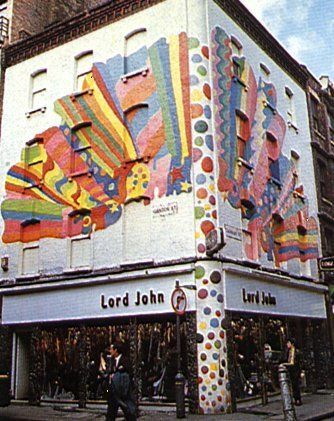 In the end we had 2 shops in Carnaby Street itself, numbers 10 and 43, (our second and flagship shop being on the corner of Ganton Street and Carnaby Street which was the old Lord John shop-another pioneer of the original Carnaby Street of the 60`s.) My office, on the 2nd floor was decorated, (by the old owner of Lord John who I think was Warren Gold) in a fantastic burgundy paisley shirt fabric. The floor was raised by about 6 inches and the void was filled with sand so I can only imagine that in the 60`s he had turned the room into a flat and had soundproofed it with the sand. If walls could speak, I bet there were some great parties held in the very heart of Swinging London. A shop in the centre of Birmingham and a short- lived one in Romford completed the line-up of our “empire”. Oh, and 3 years of our iconic mail order catalogues that will be shown on their own pages on this site. As I remember stories or find lost photos I will add them to both the website and Facebook. And if YOU have anything that you think is apt, then PLEASE contact me so that I can add it to my sites. Don’t worry, I won’t ask where you got the stuff from. Now. Fast forward nearly 30 years. Easy to say like this but, like most people, I had a roller-coaster 30 years. I’d had highs and I was in for some real lows. 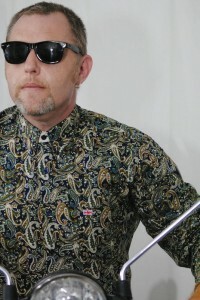 Anyway, I go to see a Mod Ska band in Fuengirola on the Costa del Sol, by the name Loony Toonz. They`re a great band doing covers of all my favourite Jam, Madness and old Ska tunes. 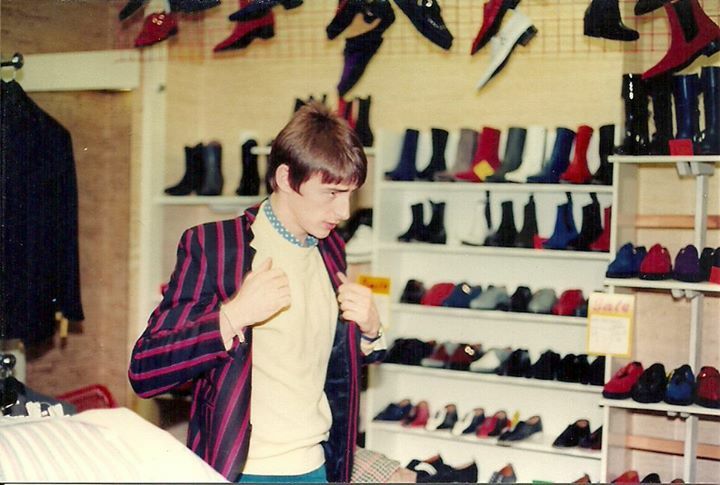 my story of my links with the 70s and 80s mod/ fashion scene and he was shocked because, as a young mod living in Southampton, he used to travel up to Carnaby Street to visit the shops on Saturdays to buy his clothes and shoes from Melanddi. And see, he´s still talking to me so the quality must have been ok!! A few days later we meet up for a beer, or two, or…. Ok, you get the picture, and The Reverend says he wants a stronger identity for the band and doesn’t just want to be a covers band. Loony Toonz are getting a following from both ex-pats and Spanish mods and skins and could I design some clothing for them. Well I thought about it and then made some calls to see who was still in business, and who was still alive and made contact with one of my old shirt suppliers. Too glib to say and the rest is history because the rest is to be seen. I had always kept my eyes and ears open for music and fashion so it didn’t take long to come up with some ideas for some shirts. So the Melanddi brand is back once again. 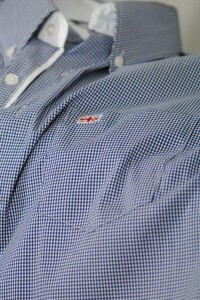 The shirts are a cross between a blast from the past and perhaps the birth of a new modern classic. The shirts are both retro AND modern. 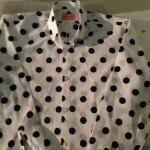 Have a look at the shirt page and see the New Melanddi Button Down shirts.